More Macarons! French Vanilla Macarons this time! 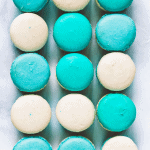 If you follow my recipes for a while, you notice I enjoy making macarons and cupcakes the most probably. And vegan desserts, but anyway, this isn’t vegan because it takes eggs, and I have yet to work on a vegan macaron recipe, although a couple of people have messaged me about it. I will try soon! And hope to publish the results here! Anyway, these French Vanilla Macarons are very simple. 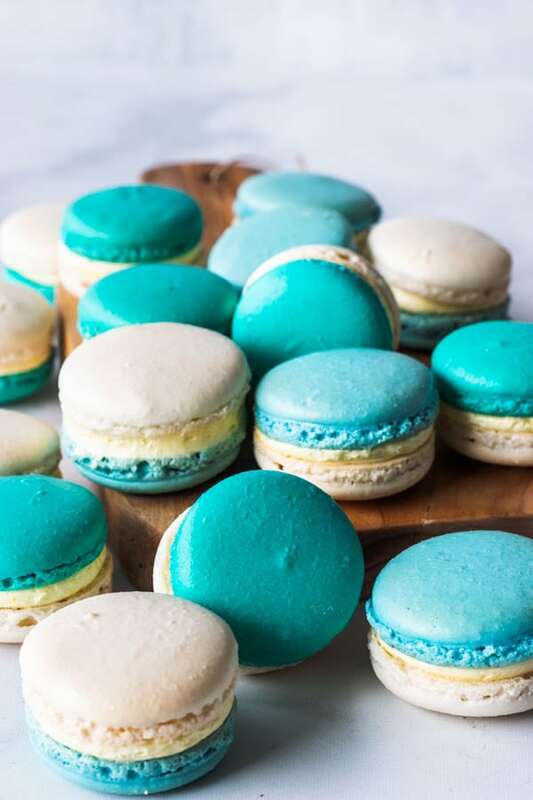 I decided to make them blue and white, maybe I was inspired after searching for some Easter recipes inspiration. 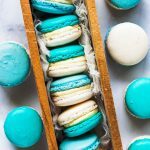 I made an Easter macaron recipe last year, my Robin’s Eggs Macarons. They were served at my son’s birthday party hint: it was a Peter Rabbit themed party. Other Easter macarons we had at the party were: Matcha Macarons, and Lemon Macarons. Anyway, here we are, almost a year later, Easter right around the corner, and I won’t be ashamed to say I’m already in the mood. I love the holiday, and specially now that is around my son’s birthday, and the beginning of spring, making it one of the most fun times of the year. 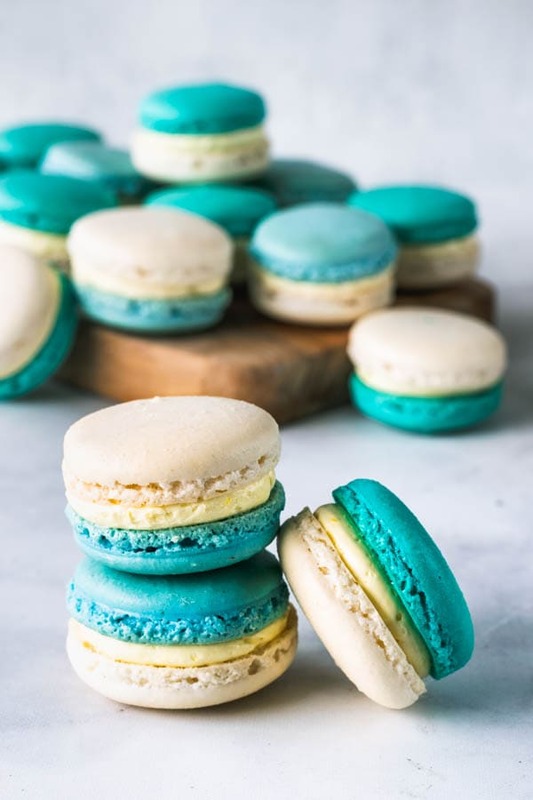 These are called French Vanilla Macarons because they are filled with a French Vanilla Buttercream, which is a yolk-base buttercream. We start by making an egg/sugar syrup and bringing its temperature up over a double boiler, while whisking non-stop. Once the yolk syrup reaches 155F, we remove it and whip it at a high speed in the mixer. That’s because at 155F, the yolks will be at a safe temperature to be consumed. Anyway, once we whip the yolk/sugar mixture and achieve stiff peaks, we can start to add the butter until a thick, smooth cream forms. 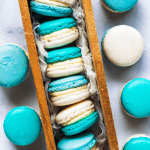 These French Vanilla Macarons are perfect for freezing, since their filling is a simple buttercream. 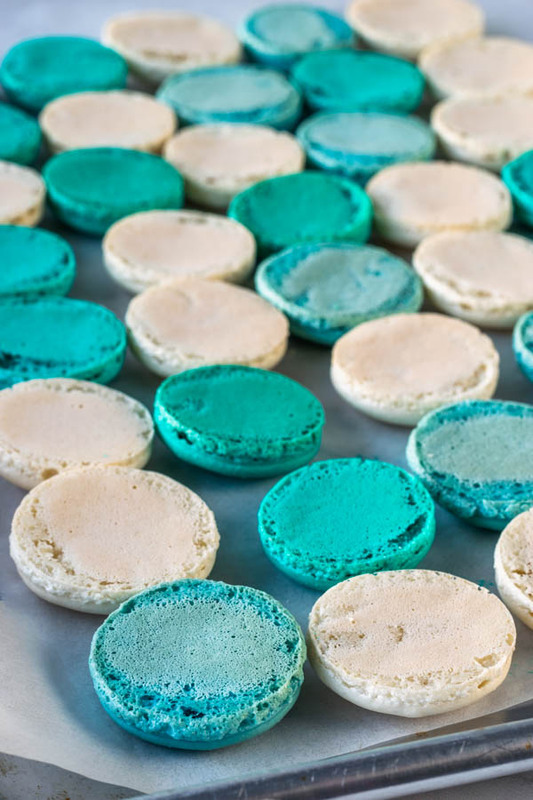 You don’t want to freeze macarons that take a wet filling such as jam. That’s because the jam will make the macaron shells too wet, and they simply won’t freeze too well. 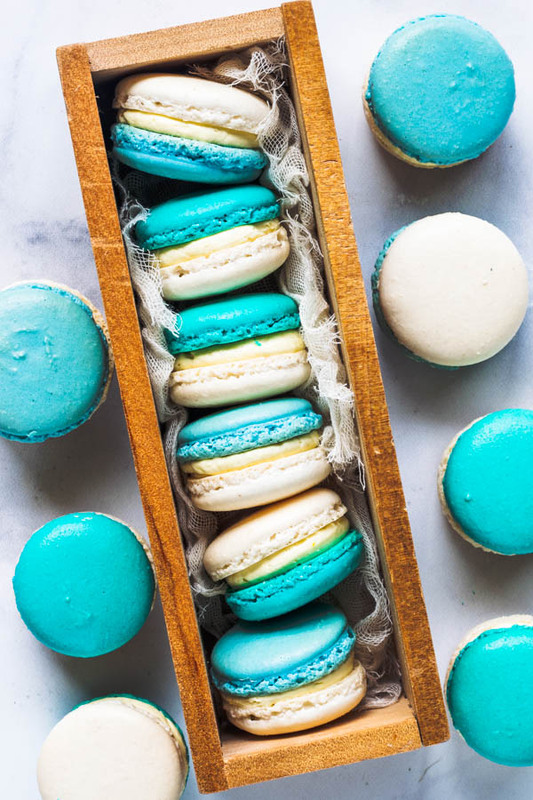 Now these French Vanilla macarons are just perfect for that. 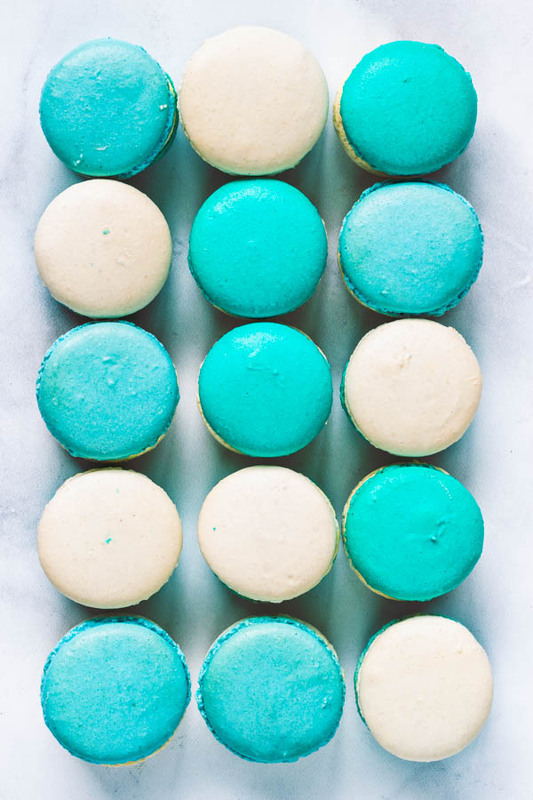 Which is why I love macarons for birthday parties and events, because they can be made ahead and frozen, since they freeze beautifully. 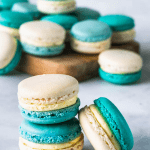 I have started writing a macaron e-book. I still don’t have a date to release it yet, but at least I’ve started it. I’ve written a few pages so far. 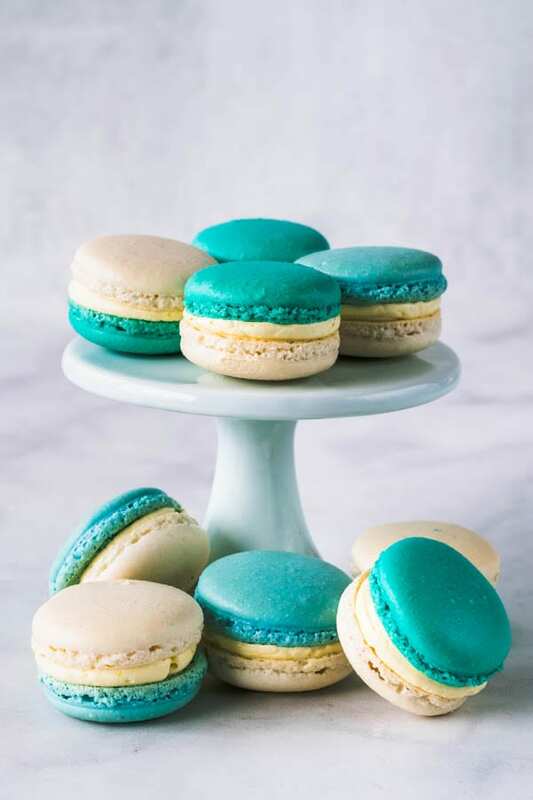 There are many questions I want to answer, and I realize how hard making macarons can be, so I want to be able to help everyone that wants to learn, by providing valuable tips I’ve learned through the years of making macarons, failing at it, and also succeeding. 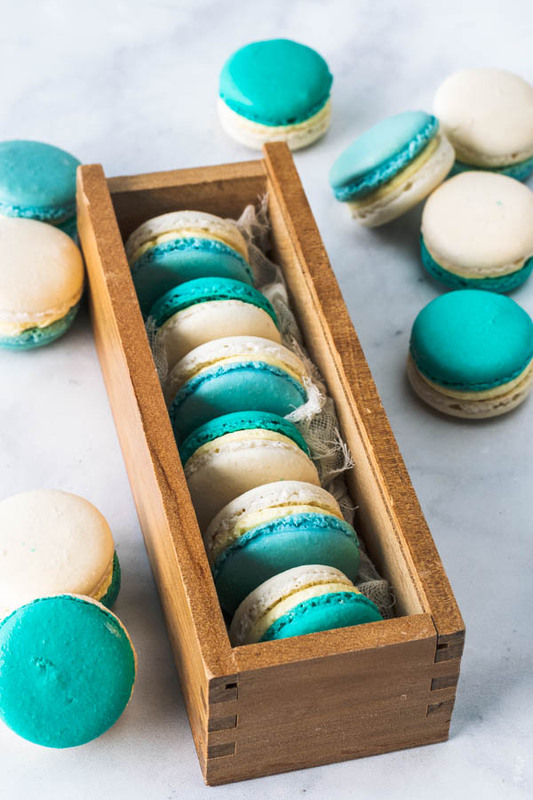 These Macarons are filled with French Vanilla Buttercream, a yolk-base buttercream. Very delicate and not overly sweet. Start folding gently forming a letter J with a spatula. Add the food coloring at this point if you would like to use any. Start by bringing a small pot with about 1 inch of water to a boil. In the bowl of your mixer place yolks, sugar, vanilla, and bourbon (or liquid of choice). Whisk until combined over the pan of boiling water. Make sure the bottom of the bowl isn’t touching the water at all. Whisk mixture until yolks reach 155F. Transfer bowl to the mixer stand, and start whisking the yolk-sugar mixture at high speed until fluffy and stiff, for 7-8 minutes. Add butter to the mixer, one tablespoon at a time, scraping the bowl if necessary. Mixture should come together and form a creamy, smooth, yellowish, thick buttercream. Muita inspiração pra fazer um doce assim, parabéns Ca!!!!! !